Horizon International, stock and recommend pavers sealers suitable for each of their paving products. It is important to realise sealers are not created equal. Not all sealers are suitable for all paving products. 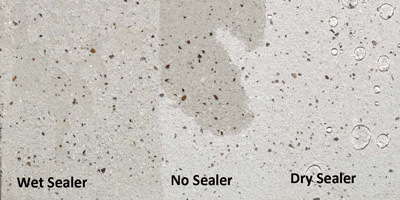 Natural Stone has different technical properties to a concrete paver and require a different paving sealer, a small test area should always be trialed. The sealing range recommended by Horizon is the Guard It Solutions range, featuring a Drylook sealer and a Wetlook sealer. Both products provide protection from staining and assist in long term maintenance/cleaning of Horizon products. The choice between wet or dry is mainly aesthetic. It is important when carrying out sealing that your pavers are in a optimal state for cleanliness, pavers should be dry and free from marking. The Image above shows the Veneto Bragato Image with the addition of the two Guard It Sealers, the first image is in a dry state, the second image after the addition of a potentially staining material. From the images you can see the protection afforded to the paver by sealing either a wet or dry seal.